Ketogenesis is the biochemical process by which organisms produce a group of substances collectively known as ketone bodies by the breakdown of fatty acids and ketogenic amino acids. This process supplies energy to certain organs (particularly the brain) under circumstances such as ketogenic diet and fasting. Acetone is a good indicator of Ketogenesis because it is spontaneously released from the primary ketone AcetoAcetate. The more AcetoAcetate the liver produce, the more Acetone will be released. 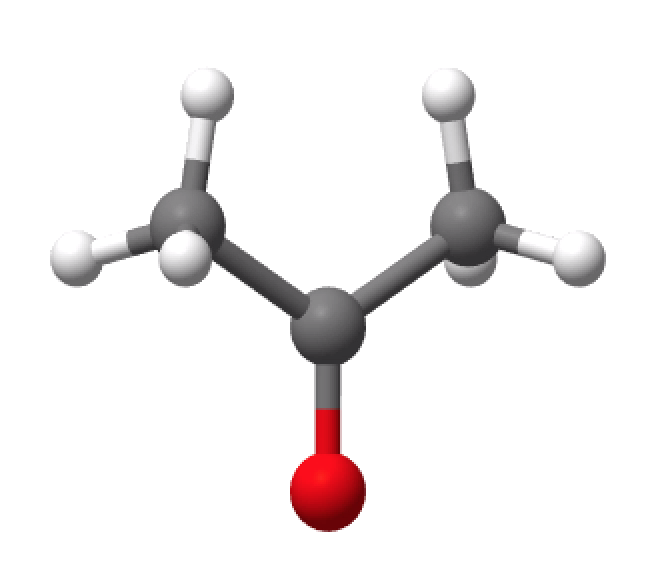 Before breath ketone analyzers it was common to measure the blood ketone Beta-Hydroxybutyrate. Technique is similar to measuring blood glucose and equipment is relative easy to use for nurses use to handle blood samples in the lab. As the concentration of blood ketones depends on several factors, it is more a trace of ketones rather than a measure of the ketosis intensity. Ketone bodies are produced mainly in the mitochondria of liver cells, and synthesis can occur in response to an unavailability of blood glucose, such as during fasting. Other cells are capable of carrying out ketogenesis, but they are not as effective at doing so. Ketogenesis occurs constantly in a healthy individual. Ketogenesis starts when there are low glucose levels in the blood, after exhaustion of other cellular carbohydrate stores, such as glycogen. Also when there is insufficient insulin (type 1 diabetes). The production of ketone bodies is initiated to make available energy that is stored as fatty acids. Fatty acids are enzymatically broken down in beta-oxidation to form acetyl-CoA. Under normal conditions, acetyl-CoA is oxidized by the citric acid cycle (TCA/Krebs cycle) and then by the mitochondrial electron transport chain to release energy. When the amounts of acetyl-CoA generated in fatty-acid beta-oxidation challenge the processing capacity of the TCA cycle; i.e. 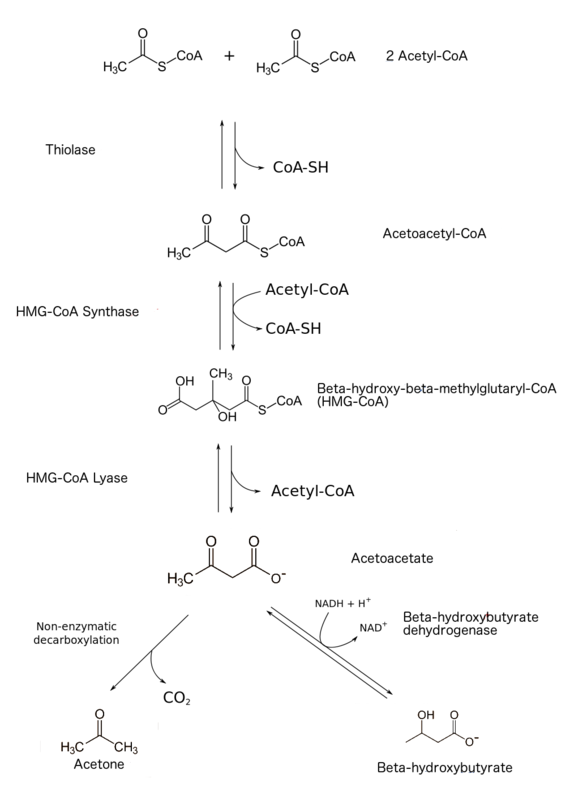 if activity in TCA cycle is low due to low amounts of intermediates (oxaloacetate), acetyl-CoA is then used instead in biosynthesis of ketone bodies via acetoacyl-CoA and beta-hydroxy-beta-methylglutaryl-CoA (HMG-CoA). Furthermore, since there is only a limited amount of coenzyme A in the liver the production of ketogenesis allows some of the coenzyme to be freed to continue fatty-acid beta-oxidation. Depletion of glucose and oxaloacetate can be triggered by fasting, vigorous exercise, high-fat diets or other medical conditions, all of which enhance ketone production. Deaminated amino acids that are ketogenic, such as leucine, also feed TCA cycle, forming acetoacetate & ACoA and thereby produce ketones. Besides its role in the synthesis of ketone bodies, HMG-CoA is also an intermediate in the synthesis of cholesterol, but the steps are compartmentalised. Ketogenesis occurs in the mitochondria, whereas cholesterol synthesis occurs in the cytosol, hence both processes are independently regulated.